This strong, 12-V winch has an impressive pulling capacity of 3000 lb (1361 kg). It is equipped with a water-resistant contactor that supplies the amperage required for higher pulling capacities. The winch also includes a special wiring harness that allows a quick connection to the 12-V power supply at the front of the Gator. The rear wiring harness with quick connection can be purchased through Parts. 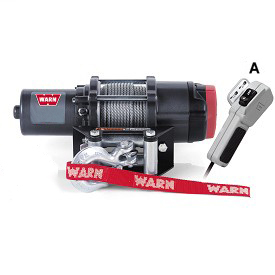 The winch has a 10-ft lead and water-resistant remote for safe-distance operation. It also comes with a four-way roller fairlead to minimize rope abrasion and pulling resistance. This BM23104 winch is compatible with all model year 2011 XUV Utility Vehicles and is bumper mounted. For rear mounting, the BM23105 multi-mount receiver kit is required.